Photo: (left to right) HP+ Mali Director Seydou Traore; Mayor of Commune 4 of Bamako; President of the Health Commission Ba Sikasso; and Minister of Health Samba Ousmane Sow at the National Assembly. 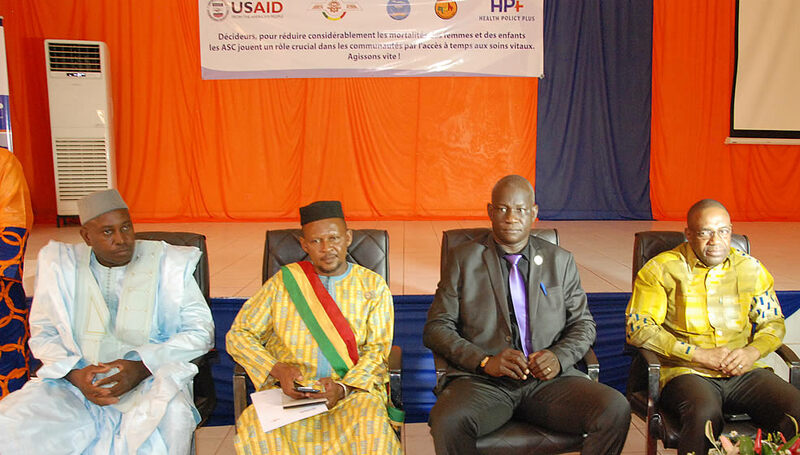 On May 15, 2018, HP+ Mali collaborated with the Health and Social Development Commission and Community Health Association of Mali to lead an advocacy session for Mali’s National Assembly. The session promoted increased domestic resource allocation for community health workers (CHWs) who deliver essential healthcare services at the community level. The session was attended by the Minister of Hygiene and Public Health, the President of the Health and Social Development Commission, and the President of the Community Health Association; representatives from USAID and UNICEF; and more than 100 mayors, civil society representatives, and technical and financial partners, demonstrating a strong commitment to obtaining financing to ensure sustainability of the CHW program. As a result of HP+ advocacy, the Ministry of Hygiene and Public Health committed to developing sustainable financing mechanisms for CHWs, and stakeholders publicly demonstrated support by signing their commitment to the cause.